Said Akl said that the Arabic language died a thousand years ago. And he is not completely wrong. The Arabic language died the year it was born. It is not a natural language, but a medieval Esperanto. It is a collection of words, gleaned here and there in the Middle Eastern languages, for the need to create a sacred book called the Quran. Four years ago, we lost Saïd Akl, an immense poet, speaker and linguist, to whom Université Notre-Dame decided to pay tribute by awarding annual prizes bearing his name. On this occasion, L’Orient littéraire publishes an unpublished interview that this unconventional thinker gave in 2002 to Jean-Baptiste Para and Alexandre Najjar. In your poetic collections, especially in The Book of Roses, the word « beauty » often comes up. You have always been a beacon of beauty. « It’s beauty that will save the world, » said Dostoevsky. The poet is the one who creates beauty, like God. You almost became an engineer and taught mathematics in your youth before becoming a writer. You speak a lot about the kinship between science and poetry. Poetry is the sister of geometry. She, herself, is geometry. A classical verse is comparable to a theorem. When I write poetry, I think about the idea, the approach it will follow, and, in the end, what it shall prove, and to the final verse, which shall complete the poem … geometry makes intelligence work. It can be understood by a mathematician and taught to a little schoolboy. Similarly, a good verse must be able to reach a great technician as well as a twelve-year-old girl who knows nothing about the theory. I like this criterion that simply distinguishes good poetry from bad. You wrote in Arabic, Lebanese, but also in French. You have published two collections of poems in the language of Paul Valéry, your favourite writer. I am indeed a great admirer of Valéry. I am the heir of the demanding poetry, symbolized by Homer, Valéry and Mallarmé. I am of this lineage. Paul Valéry has written remarkable poems and very beautiful prose texts. I like the poet as much as the prose writer, as in the case of Baudelaire, whose prose is just as beautiful as poetry. Valéry was a very educated poet, but he lacked godly belief. He admired Christ, but he was an atheist. If I had known him, I would have taken him out of atheism! To know God is to know great things. Without God, our civilization would be petty. 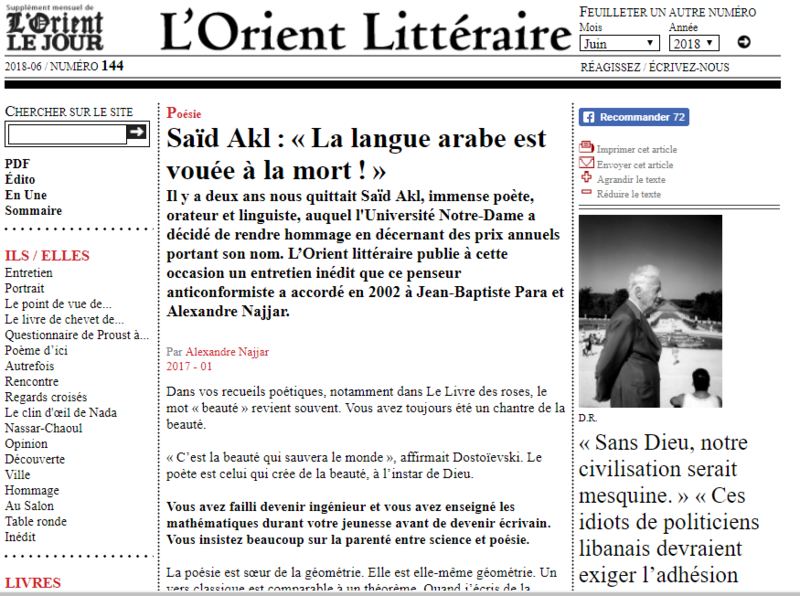 What is a good poet in the eyes of Saïd Akl? A good poet is first and foremost a person with high knowledge. The verse is firstly a thought. Take Lucretius, Shakespeare, Goethe and, in painting or sculpture, Leonardo da Vinci and Michelangelo. These artists were superiorly cultivated. I like the poets of knowledge. I do not accept the whining poet who complains about the departure of the beloved woman if, behind his words, there is no thought. A philosopher should also be interested in my poetry. Secondly, what I create must be innovative, whether it is a writing that is out of the ordinary. For me, the construction of a verse is essential. It’s hard work: I can occasionally spend a week building a single verse! It is also necessary that the words are well chosen, that the rhyme is rich, that the poem is well paced. Finally, the poem « throbs ». When making love, the woman must feel that something is throbbing in her. It is the same with poetry: palpitation is essential! Alas, many poets are lacking masculinity … In the end, we must feel that the poem was created without effort. If one gives the impression of having « gasped » while creating it, it will be seen as a failure. In poetry, freshness is fundamental! Do you consider that Arabic poetry evolves? It evolved with me, and perhaps with Ahmad Chawki … In reality, Arabic poetry is weak. It is a desert girl. But the desert is incapable of producing anything. Take al-qafieh, the Arabic rhyme. It is repetitive at will, monotonous. I myself wrote a poem of sixty verses using the same rhyme. People applauded, but I suffered martyrdom! In Europe, whose literatures include many magicians of the verb, it’s different: a poem with a single rhyme is unthinkable! How can an author like you, who has written remarkable works in Arabic, be so severe with his mother tongue? Is this not paradoxical? I taught Arabic at school and university for thirty years. If I became a great Arab poet, it is to be able to say, precisely, that the Arabic language is doomed to die. Arabs are neither poets nor artists. There are certainly a hundred verses written by Arabs who are among the most beautiful in the world, but that’s it … At the age of 17, I had translated Le Lac de Lamartine into Lebanese and Latin characters. But I was aware at the time that I could not lead my linguistic revolution and advocate the writing of the Lebanese language in Latin characters instead of Arabic, before becoming myself a great writer of the Arabic language and to have the legitimacy to freely express my ideas! When he wrote La Comédie (The Divine Comedy), Dante came up against the incomprehension of his contemporaries who reproached him for giving up Latin to write in a popular, « vulgar » language: the Tuscan dialect. By imposing Tuscan as a literary language, Dante was not mistaken. The problem in the Arab world is that there is a gap between thought and language which, unfortunately, is no longer appropriate. But language is the instrument of thought. If this instrument is obsolete, it should be changed! But how could you write in a language that, in your eyes, is a dead language? You have always defended Europe whose myth was born on the shores of South Lebanon. How does this concept affect you as Lebanese? In a text entitled « Who is European?” Paul Valery states: « Wherever the names of Aristotle, Plato and Euclid have had simultaneous meaning and authority, there is Europe”. I like this formula, which emphasizes the importance of Euclid, the son of Tire. If you take away Phoenician scientists from Europe, it becomes impoverished. Apart from Euclid, take Cadmos, the father of the alphabet; Pythagoras, who was initiated at Sidon, Tire, and Byblos; or even Môchos de Sidon, the father of the atom … Without them, Europe would lose a large part of its cultural heritage … Paul Morand affirmed that « Tyr and Sidon were once the whole history of the world ». Which European city – including Paris, which I love deeply – could say the same? None of them! In your opinion, should Lebanon be part of the European Union? Of course! When I learned about the creation of the C.E.E., I was thrilled. But Europe must necessarily be done with Phenicia. I cannot conceive of the European Union without Lebanon. Victor Bérard, who was chairman of the Foreign Affairs Committee in the National Assembly, said that « Phenicia is the motherland of this overseas called Europe »! We are told about the entry of Turkey or Israel into the European Union, it is an aberration! These idiots of Lebanese politicians should demand the immediate accession of Lebanon to this Union which I consider as the poetic masterpiece of the twentieth century! Elie Choueiri Prize, Music Prize. « des mots glanés ici et là dans les langues du Moyen-Orient. Primo le moyen ORIENT est une création en opposition avec l’AFRIQUE DU NORD dont les colonisateurs allemands mais surtout anglais français sont à l’origine. La vraie question pourquoi l’avoir créé?..La réponse ,quand on connait la vérité historique sur l’origine du dogme (l’arianisme version punique ,devenu « islam », langue religieuse des sarrasins africains usurpée après la colonisation pour de l’arabe, est toute trouvée. Comment des termes comme calife « axelaf,mhemdh, illa lah,s yisem lah,..devenu muhamed,bi ism lah devenus de l’arabe dont le terme vient de a3rav ..C’est ainsi qu’on a phagocyté tamazight. Et qui est à l’origine ? Non l’islam n’est pas en né en Arabie qui était un espace nord africain depuis l’époque atlante nord africain civilisateur de l’humanité, dont ,Uzal,devenue sanaa ,san3a (yémen),yathrib ,yath RBi,un autre dieu païen ,existait bien avant l’époque du prophète arianiste créé par le vatican . Les chrétiens étaient bp plus nombreux en Afrique du nord latine le vatican est l ‘origine des guerres des croisés qui ont servi à la création de l’EUROPE qui correspond à la période dont on fait croire à l’invasion et la destruction par les « arabes imaginaires » terme inusité jusqu’à la création du faux peuple d’autant conquérant .Il fallait noyer l’imposture . La preuve cela a marché mais nombreuse incohérences demeurent si l’on prend le vrai fil de l’histoire . Les fatimides civilisateurs descendants de la lignée direct de Fatima ne peuvent être des arabes. Alors comment peut-il y avoir des califs arabes? Qu’elle est l’origine des civilisateurs abbassides? Trop de choses à dire..
Je finis juste avec la grammaire dont les ancêtres des zwawas sont à l’origine que l’imposture coloniale s’est servie pour habiller sa création ARABE ,à l’image du cheval de barbe ,des chiffres etc…Non ce qui arrive à l’Afrique du nord n’est pas une mal »diction mais un travail de sape millénaire . L’hébreu est tout aussi nord africain …Intersectez-vous à l’histoire des atlantes africains et de leur monde punique à l’origine de tout . . histoire PLURIMILLÉNAIRE .. Cachée. La langue mère vous aidera à comprendre si vous décortiquez chacun mot . Lquran,qoraych’it) qoray it..loumma,vrahem,ya3cov..taktuvt,kutub,lmeghrev,meghreb. Tout le patrimoine africain est rendu juif et arabe . Je ne suis pas linguistique pour connaitre les origines des mots que l’ont dits langue arabe. Ce que je sais. et la nous sommes certainement d’accord , est que l’histoire officielle a gonflée la communauté bédouine du desert de l’arabie pour en faire une peuple et une grande nation, avec des villes comparables aux mégapole de l’époque. Nous sommes bien d’accord que l’islam c’est de l’arianisme qui a dégénéré en islam. Que ceux qui sont derrière ce complot contre l’humanité connaissaient parfaitement la mythologie dite grecque. La mecque elle meme est une des preuves que c’est une invention dont les bédouins sont totalement étrangers a la confection de « leur » religion. Je m’imagine mal les quelques bédouins parsemés dans le désert d’arabie lisant Homère et connaissant la légende d’Apollon et de Délos. Merci pour tes précieuses contributions..ha si tu pouvais aussi les faire en anglais?